Börlind Sunless Bronze är en brun-utan-sol för hela kroppen. 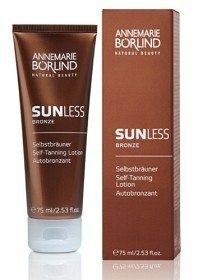 Sunless Bronze ger en varm lätt solbrun färg utan att du behöver spendera timmar i solen. Effekten kommer efter några timmar. Aqua (Water), Arachis Hypogaea (Peanut) Oil, Sesamum Indicum (Sesame) Seed Oil, Coco-Caprylate/Caprate, Dihydroxyacetone, Polyglyceryl-3 Methylglucose Distearate, Sorbitol, Glyceryl Stearate, Juglans Regia (Walnut) Shell Extract, Isopropyl Myristate, Methyl Glucose Sesquistearate, Phenoxyethanol, Glycerin, Benzyl Alcohol, Panthenol, Xanthan Gum, Aroma (Fragrance), Benzyl Benzoate, Linalool, Benzyl Salicylate, Limonene, Lecithin, Hexyl Cinnamal, Tocopherol, Ascorbyl Palmitate, Potassium Sorbate, Citronellol, Coumarin, Eugenol, Citric Acid.